Embarkation is hot and lots of walking. We had hoped to have a stroll along the waterfront in San Antonio, but it would be really difficult to get off the ship and go the distance to do that. We were exhausted! Staff on Princess has been reduced in the past two years and it shows. Pampering is pretty much a thing of the past. We were lucky enough to have a mini-suite, but on this cruise it is just too cold to use the balcony except at the beginning and end. We used the extra room very little. Club class amenities were kind of dumb. Both port and starboard are great choices for this cruise. At the most important cruising view spots, Amalia Glacier and Cape Horn, the ship does 360 slow turns so everyone has time on their side of the ship. Most of the cruise is through channels so there are spectacular views on both sides. Who knew the Andes go all the way to Antarctica? Beyond the tip of the continent, they continue as soaring islands. Stunning! We had the best waiter in my long history of sailing. Alvin Villanueva in the Amalfi. Get him if you can. The "violin virtuoso" Jakub Trasak is truly unique, talented, entertaining and engaging. There were few children on this cruise, but the ones onboard our cruise were really disruptive and dangerous for older people&apos;s ability to stay upright. The staff was never seen trying to correct this. Safety is supposed to be their job. And strobe lights...for God&apos;s sake, they are dangerous, even life threatening for some, and not all that entertaining. Why does anyone with a heart and ethics still use them? USB ports on bedside lamps. Yay Princes, welcome to the 21st century! You may know that on the Star (and probably many of the ships updated in dry-dock this year), the specialty restaurants, particularly Sabatini’s, have been significantly changed: Sabatini&apos;s is small, no banquettes, it is all hard surfaces—so noisy, tables very close and reduced prices. We did miss one port due to weather, and we have been told it is more usual than unusual for this to happen on this cruise. It is fine, the smaller ports are kind of like Alaska without American ingenuity and a little colorless after the first one. But if one missed docking in Stanley, it would make the cruise a waste of time. And it happens once or twice each year. Stanley and the penguin tours are the highlight of the trip. We had been told Volunteer Point Excursion was the only one worthwhile. Not so. It is many hours in a very uncomfortable and sometimes painful 4 x 4 and a full day—yes, they have more penguins, but how many does one need to see? We took the Bluff Cove Excursion. It is a penguin reserve owned by a family who are so committed to making this a great experience. Embarkation is hot and lots of walking. We had hoped to have a stroll along the waterfront in San Antonio, but it would be really difficult to get off the ship and go the distance to do that. We were exhausted! Staff on Princess has been reduced in the past two years and it shows. Pampering is pretty much a thing of the past. We were lucky enough to have a mini-suite, but on this cruise it is just too cold to use the balcony except at the beginning and end. We used the extra room very little. Club class amenities were kind of dumb. Both port and starboard are great choices for this cruise. At the most important cruising view spots, Amalia Glacier and Cape Horn, the ship does 360 slow turns so everyone has time on their side of the ship. Most of the cruise is through channels so there are spectacular views on both sides. Who knew the Andes go all the way to Antarctica? Beyond the tip of the continent, they continue as soaring islands. Stunning! We had the best waiter in my long history of sailing. Alvin Villanueva in the Amalfi. Get him if you can. The "violin virtuoso" Jakub Trasak is truly unique, talented, entertaining and engaging. There were few children on this cruise, but the ones onboard our cruise were really disruptive and dangerous for older people&apos;s ability to stay upright. The staff was never seen trying to correct this. Safety is supposed to be their job. And strobe lights...for God&apos;s sake, they are dangerous, even life threatening for some, and not all that entertaining. Why does anyone with a heart and ethics still use them? USB ports on bedside lamps. Yay Princes, welcome to the 21st century! You may know that on the Star (and probably many of the ships updated in dry-dock this year), the specialty restaurants, particularly Sabatini’s, have been significantly changed: Sabatini&apos;s is small, no banquettes, it is all hard surfaces—so noisy, tables very close and reduced prices. We did miss one port due to weather, and we have been told it is more usual than unusual for this to happen on this cruise. It is fine, the smaller ports are kind of like Alaska without American ingenuity and a little colorless after the first one. But if one missed docking in Stanley, it would make the cruise a waste of time. And it happens once or twice each year. Stanley and the penguin tours are the highlight of the trip. We had been told Volunteer Point Excursion was the only one worthwhile. Not so. 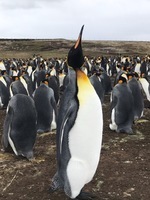 It is many hours in a very uncomfortable and sometimes painful 4 x 4 and a full day—yes, they have more penguins, but how many does one need to see? We took the Bluff Cove Excursion. 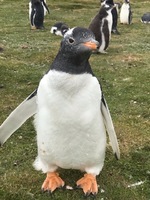 It is a penguin reserve owned by a family who are so committed to making this a great experience. Starboard. The steward was rushed and missed things. I have heard that in the past couple years Princess and Carnival have reduced numbers of crew. It shows. The beds are blissful, and again, USB ports at bedside. Hurrah! The tour was a city drive, tango show, and airport shuttle. It was fabulous. The tango show was way superior to the show Princess brought aboard the day before. Up close and personal. We went out to take a walk in the city the day before and found the terminal area is dangerous and dirty. We saw a dead rat in the gutter before we crossed a street. The sewage smells were nauseating. Get a taxi right away when you walk out a door. This is not a port for a nice walk. Ugh! Friendly people. Find the little gallery about 1/4 way up the first block. They had steel sculptures out on the sidewalk. Great prices. Wonderful stock from local artisans. Coffee shops with free wifi (slowish) if you buy a cup of coffee. Way more than Gentoo. There are about a dozen Kings and lots of Magellanic. Friendly and caring staff. Much shorter drive than others. Close to penguins who do interact. Adorable. Included cream tea with hand-baked goodies and served on china in a sit-down inside room. Lovely. Back to the ship for lunch! Others who took this excursion loved it also. No complaints I heard. If I returned, I would choose this excursion again.